The NCQA Disease Management Accreditation and Certification programs will transition into the new Population Health Program Accreditation and Prevalidation programs launching this December. The last day to submit applications for Disease Management Accreditation/Certification is November 26, 2019. In 2017, NCQA redefined the core responsibilities of plans and providers to reflect the shift in accountability and movement from single-condition disease management toward whole-person population health management. This shift was influenced by regulatory changes (ACA and MACRA), new health technologies and emerging care models driven by the movement toward value-based payments. NCQA revised its Health Plan Accreditation program to reflect this change. Modified the NCQA 2018 Health Plan Accreditation standards to include a new Population Health Management category. Removed disease management requirements from the health plan accreditation standards. Developed the new NCQA Population Health Program Accreditation program for organizations that conduct focused population health management for specific conditions or populations. 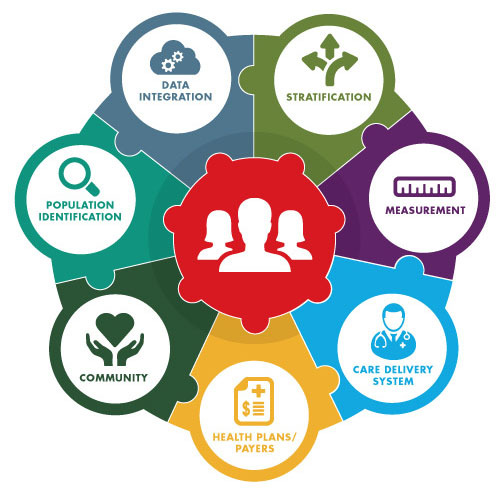 NCQA defines population health management as a model of care that strives to address patients’ health needs at all points along the continuum of care, including the community setting, by increasing patient participation and engagement and targeting interventions. The goal is to maintain or improve physical and psychosocial well-being and address health disparities through cost-effective, tailored health solutions (definition adapted from the Population Health Alliance). NCQA’s Population Health Management conceptual model captures the essentials for this model of care. This short video explains population health management. Disease Management vs. Population Health Management? Both accreditations review by program type, with the option of focusing on condition or population. Population Health Program Accreditation focuses on evaluating the population and delivering person-centered interventions based on its risk and needs. Both accreditations evaluate the organization’s programs and processes and how the programs support individuals in their care journey. Population Health Program Accreditation has one flexible evaluation option to meet multiple program needs. Disease Management Accreditation had two evaluation options for different program orientations (patient and practitioner oriented and patient oriented). Population Health Program Accreditation has fewer requirements than disease management accreditation. Some requirements are new; many are similar to those in disease management accreditation. There are several options for accredited disease management organizations interested in earning NCQA Population Health Program Accreditation. Accredited disease management organizations and organizations in the process of earning accreditation will maintain their accreditation status until the status expiration date. Apply for Population Health Program Accreditation and indicate that your status will expire before (or close to) your desired Population Health Management survey start date. Undergo a full Population Health Management Survey before November 2019. NCQA will extend your Disease Management Accreditation status until your Population Health Program Accreditation status is issued. Earn NCQA Population Health Program Accreditation. Undergo a Population Health Program Accreditation transitional survey. This survey reviews elements that are exclusive to Population Health Program Accreditation (the element intent is not reflected in Disease Management Accreditation). This status replaces your Disease Management status and expires on the Disease Management expiration date. You may also choose to renew your Disease Management Accreditation by the November 26 deadline and not transition to Population Health Population Accreditation immediately. Accredited organizations can offer automatic credit for the new Population Health Management category in Health Plan Accreditation and avoid duplicate delegation oversight reviews. The standards align organizations with the market shift to a whole person, person-centered population health management approach. Population Health Program Accreditation is more flexible than Disease Management and accepts different organizational arrangements and care delivery. Organizations can be innovative in addressing their population’s health needs. NCQA is replacing Disease Management Certification with a new program: Population Health Management Prevalidation. We encourage certified disease management organizations to pursue Population Health Management Prevalidation. Disease management organizations with current certification and organizations in the process of earning certification will maintain their status until the status expiration date. NCQA will retire the Disease Management Certification program on November 26, 2019. The new Population Health Management Prevalidation program that may be an option for organizations with health IT solutions. Prevalidated health IT solutions may offer automatic credit for certain standard requirements in Health Plan Accreditation. Earning prevalidation differentiates your solution in a crowded health IT vendor market. Vendors can advertise direct alignment of health IT functionality with NCQA Health Plan Accreditation.